I have a friend I’d like you all to meet. 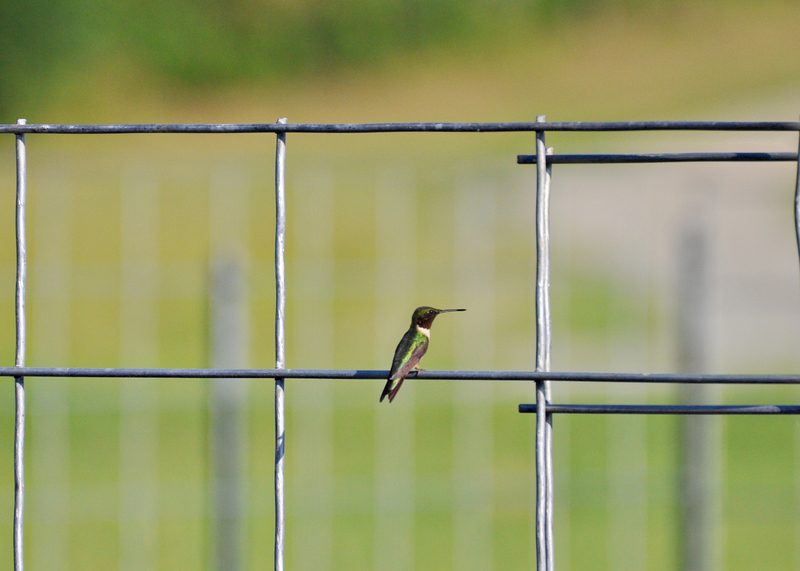 He disappeared from the farm for a short while, but has returned when the lady in charge filled the water feeder with a fresh batch of sugar-water. Originally I thought the heat presented a deterrent, but it wasn’t all that, it was just me not taking care of the details. This is Bertie. He hangs around. I mean he really hangs around. 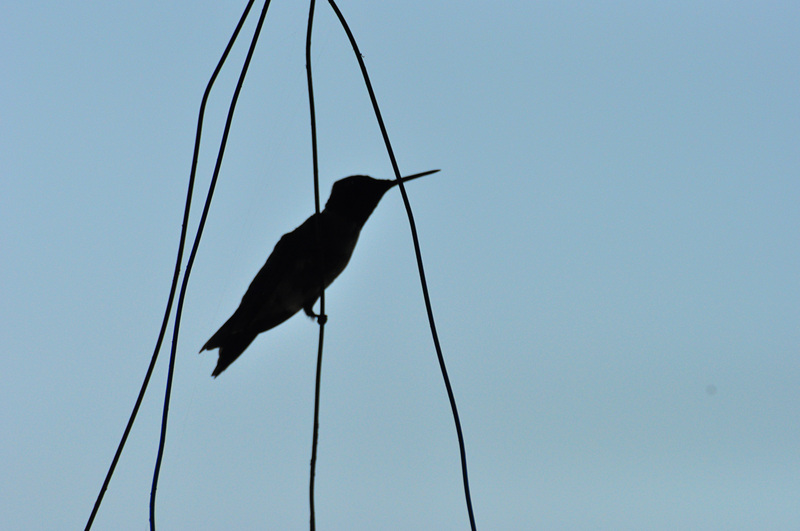 He finds the wire of my flower-pot a perfect perch for hanging out. 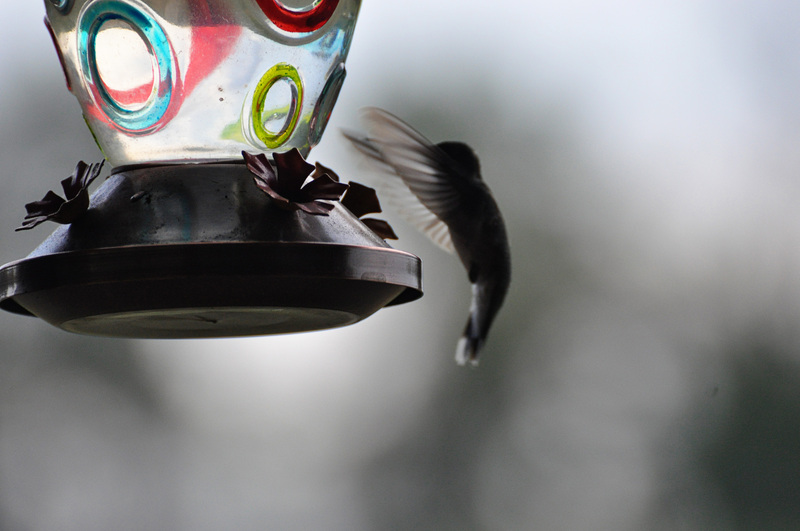 The basket wire is in close proximity to the feeder. 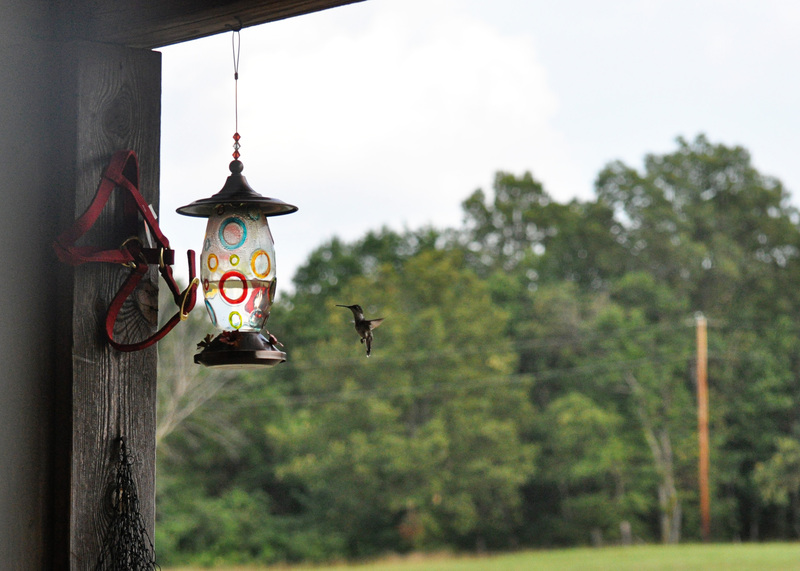 It’s an easy flutter to flit from the feeder to the wire and the wire to the feeder. 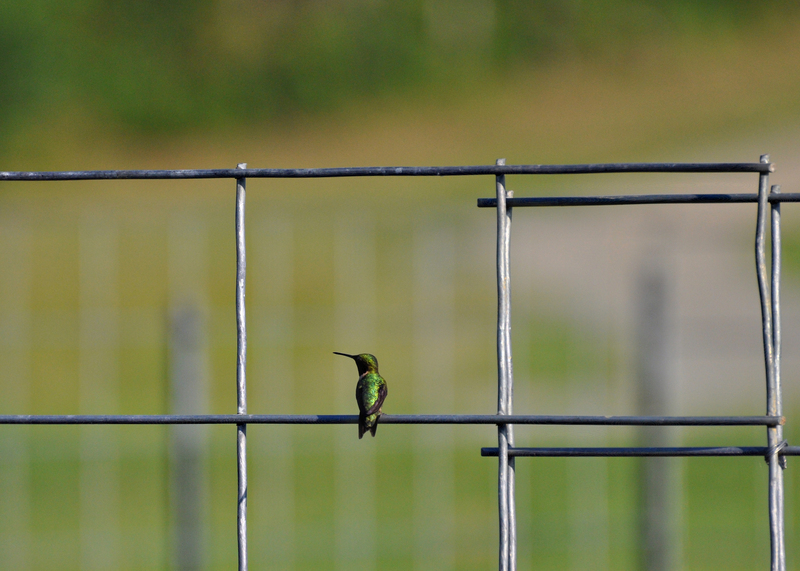 I think he sits here so he can keep an eye on that feeder. Bertie takes a good look at me. Amazingly I don’t freak him out too much. The camera is enough to undo any tiny creature. He spends a loooot of time in the air. 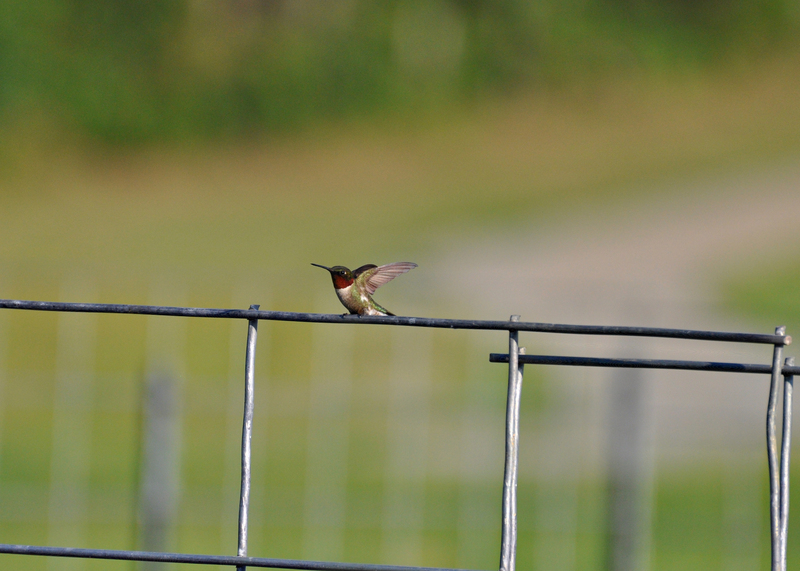 He also samples from every hole in the feeder. He gives me a good look at his back. And that is the newest piece of heaven from my little piece of heaven. 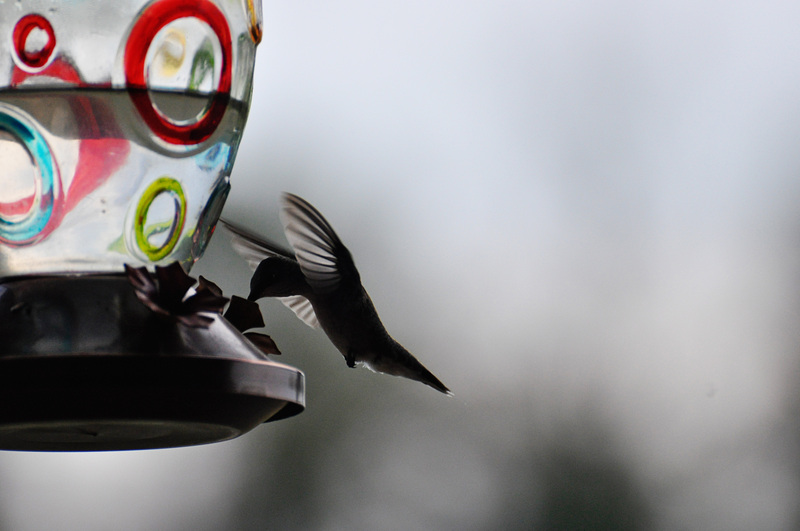 This feeder hangs in front of the window from which I sit and write half the time. It offers me such a happy diversion. I just wanted to share it with you. Living in the country, we are not alone out here. 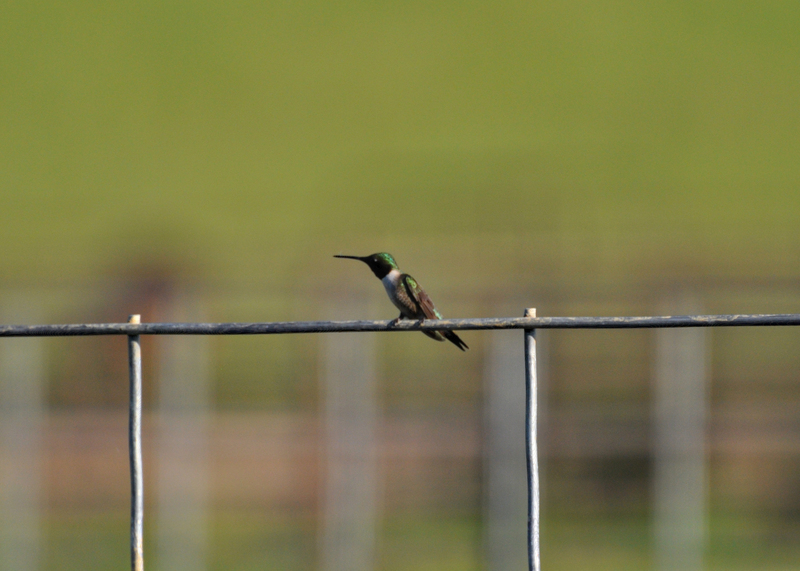 Aside from all the animals we brought here, our farm is home to numerous indigenous …. things. We have turtles and snakes. Bob Whites make nests in the tall grass. 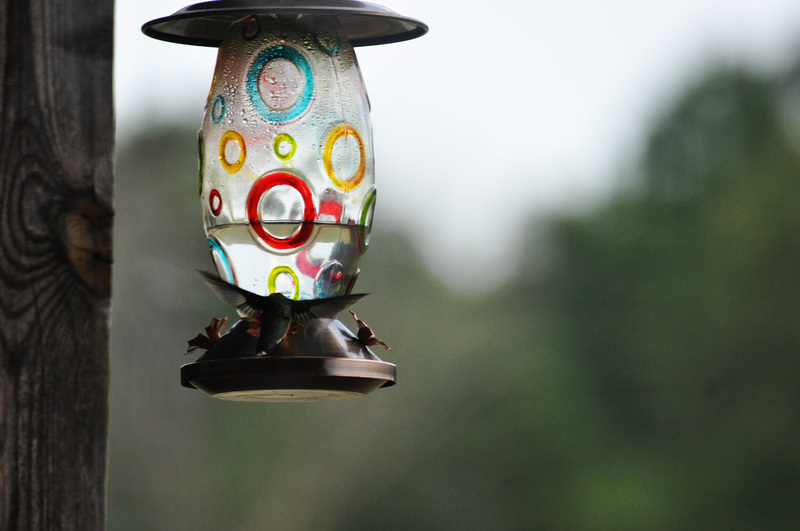 Martins nested in the tree house until the tornado knocked it over and a few hummingbirds have started frequenting my flower pots and the hummingbird feeder. 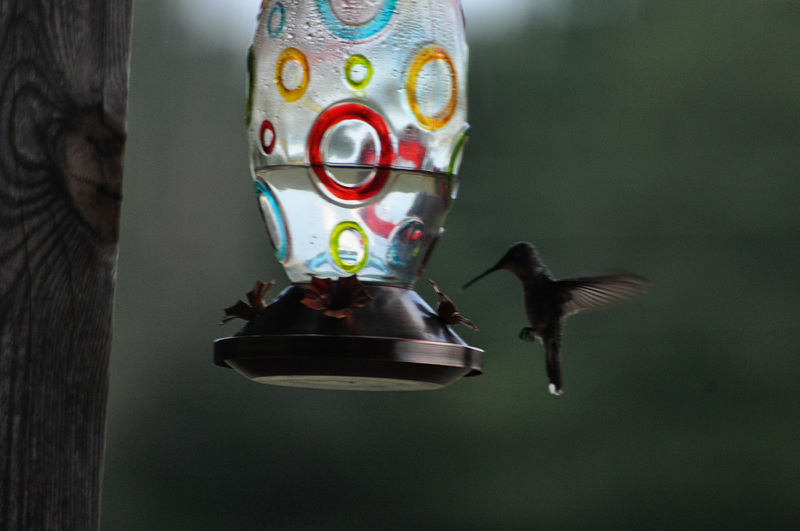 I have had fly-bys of the hummingbird variety over the years, but no permanent visitors until this year. 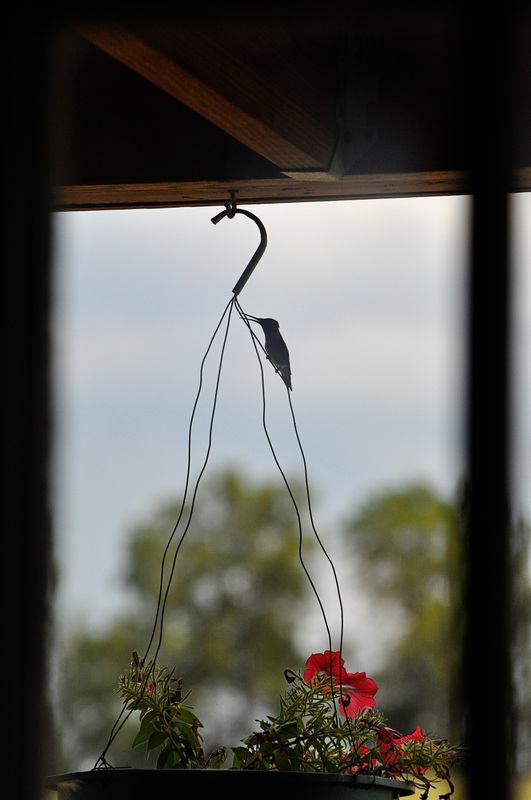 This year I hung out a hummingbird feeder. I love to watch them. 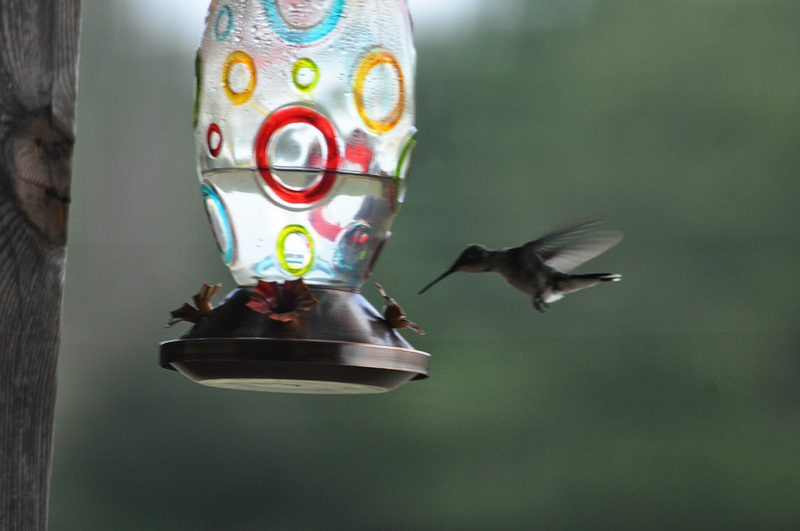 They flit and flout and hover and zip and they are hard to capture with the camera. They each have their own personalities and distinctive coloring. 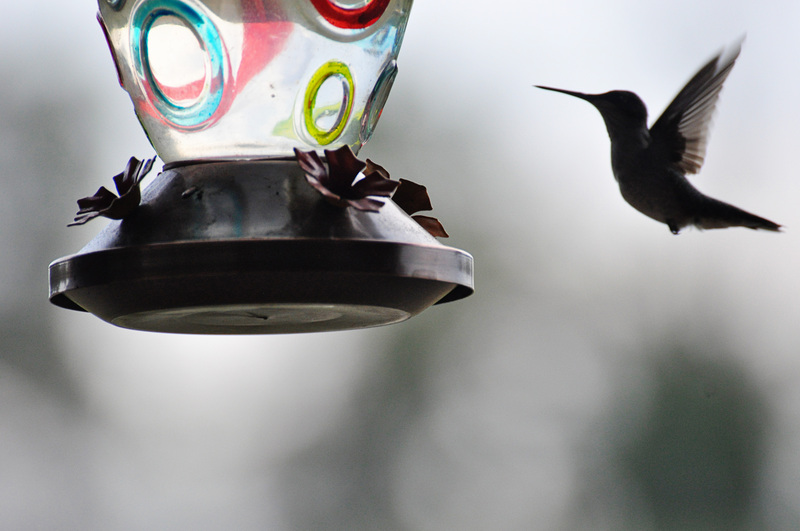 I have been stalking my feeder to catch them in motion, but with the insane heat around here, they have been scarce. Me thinks they prefer plain water to sugared water. I can’t blame them. 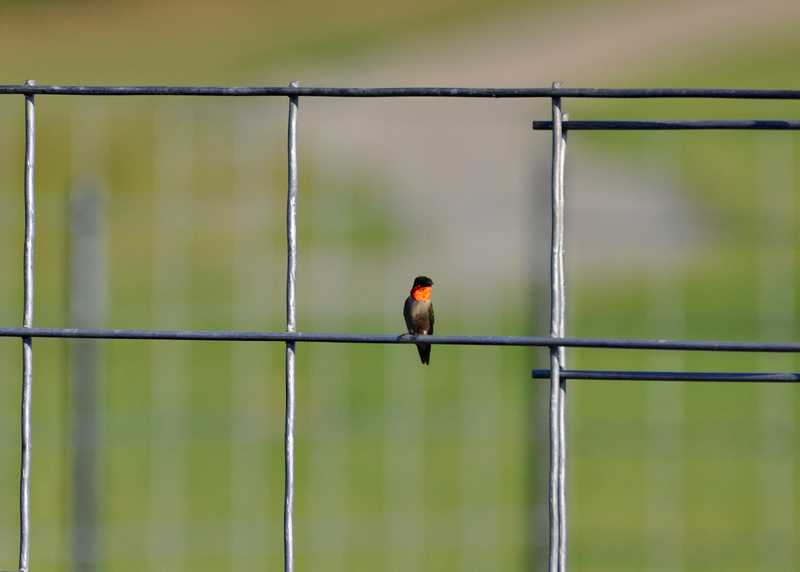 This fellow finally settled on the nearby fence. I wanted to show how small he is. Petite and strong. You should be able to see the lovely green sheen on his back. Here we have a look at his throat, which is different. The upper section of his throat appears dark here, but…. 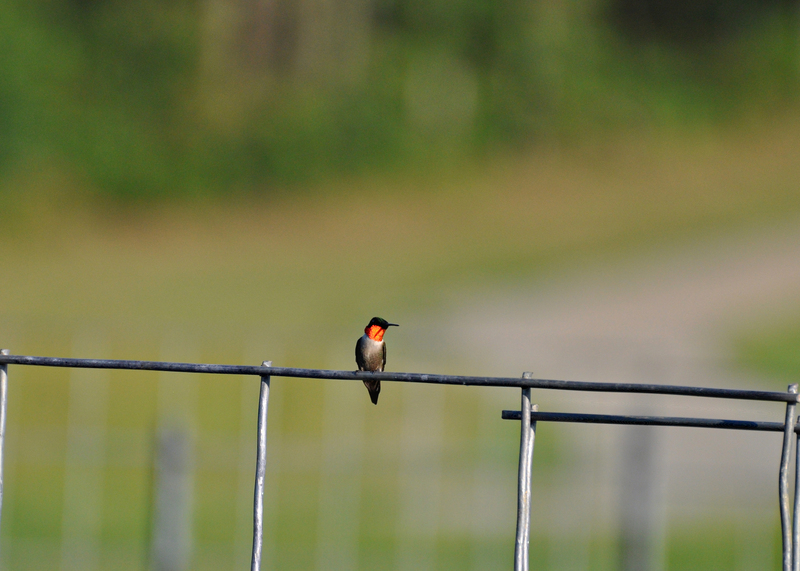 There is a brilliant red color under his bill. It glares at you in the sunlight. It amazes me. Here we have it again. Shiny red! How can such a tiny creature carry so much clout? Both in appearance and drive. Believe me, if you’ve never watched these little fellows forage and defend their territory. 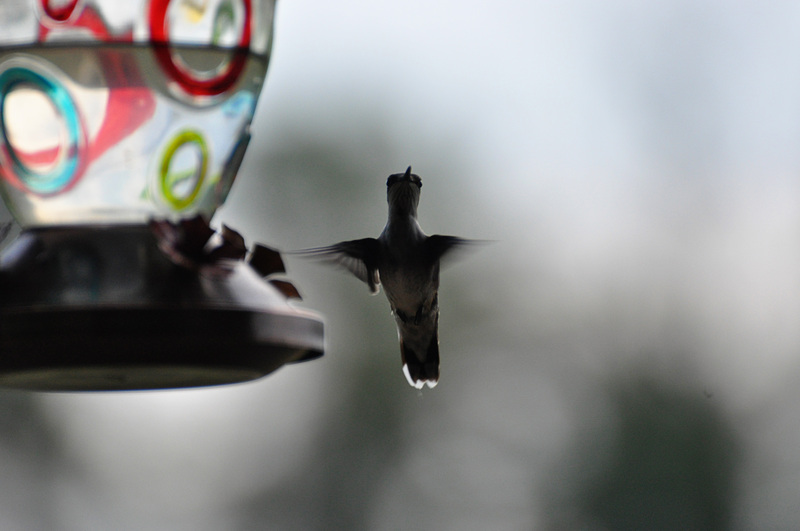 He is about to take flight. He is all glittering green with that flash of read. What better way to celebrate the summer than with a fusion of natural color in a tiny package? This is my little piece of heaven for today.